It only took 12 years for Lilith Fair to become quaint. In the decade between when Sarah McLachlan ended the festival for the first time in 1999 and her decision to take the rebranded “Lilith” off of life support in March 2011, female musicians had made significant strides in genres from hip-hop to folk. The proudly plastic pop of Britney Spears and Christina Aguilera had given a wildly popular middle finger to ’90s folk-rock and its obsession with authenticity, and no less of authorities on the subject than Bikini Kill’s Tobi Vail and Sleater-Kinney’s Carrie Brownstein celebrated Beyoncé’s all-female backing band the Suga Mamas as a sign of practical progress in the industry. Feminism had moved forward, too, embracing the intersectional politics that fueled criticisms of Lilith Fair’s majority-white lineup in its first year. Trans issues and expanding definitions of gender came to the fore, and while Lilith Fair never had the transphobic policies of its spiritual predecessor, the Michigan Womyn’s Music Festival, it never did much to challenge its own barefoot, broomstick-skirt-clad definitions of femininity, either. Artists on the revived Lilith didn’t seem sure how they fit in, with Ms. noting with disappointment that McLachlan sidestepped questions about whether she was a feminist at a July 2010 press conference. With all this in mind, Lilith Fair starts to look like The Feminine Mystique of music festivals—historically important, sure, but of little relevance outside of a specific time and a relatively privileged group of people. McLachlan certainly had legitimate complaints when she started the festival. She was, and still is, a mainstream singer-songwriter: In 1997, she released her fourth studio album, Surfacing, which spawned four singles, won two Grammys, and sold 16 million copies worldwide. (It’s the one with “Angel,” the song now forever associated with sad dogs in American Society For The Prevention Of Cruelty To Animals commercials.) But as she told Time magazine in 1997 for a piece with the cringeworthy headline of “Galapalooza!” when she released her previous album, Fumbling Towards Ecstasy, in 1993, “a lot of radio stations said they couldn’t play me because they already had another singer-songwriter on their playlist […] They were saying, ‘Go away, we’ve added our token female this week.’” Frustrated, McLachlan told her manager she’d do summer concerts only if they could put together an all-female roster, a concept that expanded into the first Lilith Fair in the summer of 1997. Acts were picked from a list compiled by McLachlan, a personal touch that ended up significantly shortening Lilith Fair’s shelf life. Most of the acts that played the main stage in the festival’s initial 1997 lineup—Sheryl Crow, Suzanne Vega, Tracy Chapman, Fiona Apple, Indigo Girls, Jewel, Joan Osborne, Natalie Merchant, Shawn Colvin, Paula Cole—all conformed to the same adult-contemporary radio-friendly singer-songwriter style, which was at its creative and commercial peak at the time. You remember the aesthetic: China flats and flowing hair, handkerchief dresses and silver spoon rings, earnest acoustic odes to cowboy romanticism punctuated with the occasional “message” song. Even the music videos, all gauze and sensual closeups of lipsticked singing mouths, start to blend together after a while. Contemporary reviews of Lilith Fair’s first year noted the homogeny of the lineup: The Chicago Tribune wrote, “This year’s Lilith presented only one type of strong woman—invariably an attractive, sweet-voiced singer-songwriter with an acoustic guitar fronting an all-male band,” and Spin remarked in its 1997 review, “Lilith’s artists, like their earth mother, tend to be spiritual, nurturing, in touch with their emotions, inwardly directed, and passive.” Even country legends Emmylou Harris and Mary Chapin Carpenter and neo-soul singer India Arie, who provided what musical diversity there was on the main stage, were of the “white Christmas lights and wall tapestry” bent. As far as racial diversity goes, Chapman and Arie were the only artists of color on that initial headlining bill. “I know why they called it the white-chicks folk fest, but I love that music,” Arie says in Glamour’s oral history. Still, if Lilith Fair didn’t represent the cutting edge of female musicianship in the late ’90s, it didn’t represent the Spice Girls and their spangled crop-top brand of “girl power” either. That feminist but still stereotypically feminine, non-threatening middle ground was safe enough for the mainstream by the late ’90s—and it sold. While Lilith Fair’s booking may have been safe, promoter after promoter had told McLachlan and her manager/co-founder, Terry McBride, that a bill with more than one woman on it was a risk that wasn’t worth taking. They couldn’t have been more wrong, as McLachlan and her milquetoast band of folk-pop troubadours immediately sold out city after city on their 35-date 1997 tour. Lilith Fair ended up with $16 million in ticket sales that year, making it the top-grossing festival tour of 1997. The 1998 tour also proved profitable, further proving the commercial point. And that’s not to mention all the merch sales—“really pretty merch,” as booking agent Marty Diamond put it. “We have jewelry, knapsacks, stuff people would want”—and the money coming from corporate sponsors like Levi’s, Starbucks, and Volkswagen, which set up booths on the festival grounds alongside local women’s groups and Planned Parenthood. So what would it take to make Lilith Fair relevant again? It’s not as if the problems it was trying to address have gone away. Yes, women have made strides in virtually every genre of music over the past 20 years, but the gender imbalance, especially in music festivals, is still there. Crunching the numbers on 996 acts playing 23 major music festivals in 2017, Pitchfork found that only 14 percent of them were female, with an additional 12 percent consisting of mixed male and female (or non-binary) lineups. The disparity is especially glaring in EDM-centric festivals like Electric Zoo, which had a 94 percent male lineup in 2016. And safety at these festivals isn’t just a continuing concern, it’s a growing one, with Salon reporting in 2015 that rapes and assaults at concerts were on the rise. The idea of safe spaces for women (both cis and trans) and queer and gender-nonconforming people at concerts does seem to be building momentum, with the Safer Spaces At Festivals campaign in the U.K. and Safer Scenes in the U.S. working to stop violence and harassment at shows. Sweden’s Bråvalla Festivalis is taking things a step further, barring men from attending a 2018 alternative festival after five rapes and 12 assaults were reported at its 2016 edition. Less extreme are measures being taken at the EDM- and jam-band-centric Electric Forest festival, which in 2016 introduced a campground exclusively for people who identify as women. Meanwhile, onstage, TUF Fest, a festival featuring performers from the “female, non-binary, and trans electronic music community” debuted in 2016 as well. But while EDM is currently taking over the pop-music world, Lilith Fair was, and still could be, a more mainstream affair. Name the biggest pop stars in the world right now, and you’re going to get a long list of female artists, with Beyoncé, Rihanna, Miley Cyrus, Lady Gaga, Adele, Taylor Swift, and their peers equaling or outselling the Ed Sheerans and Justin Biebers of the world. For her part, McLachlan knows when to quit, saying in Glamour’s oral history that “Lilith could work today, but Adele, Taylor, or Beyoncé would have to spearhead it.” We’d go a step further and nominate Solange or M.I.A. or FKA Twigs, or perhaps Lilith alum Missy Elliott, who’s experiencing an artistic renaissance of her own right now. 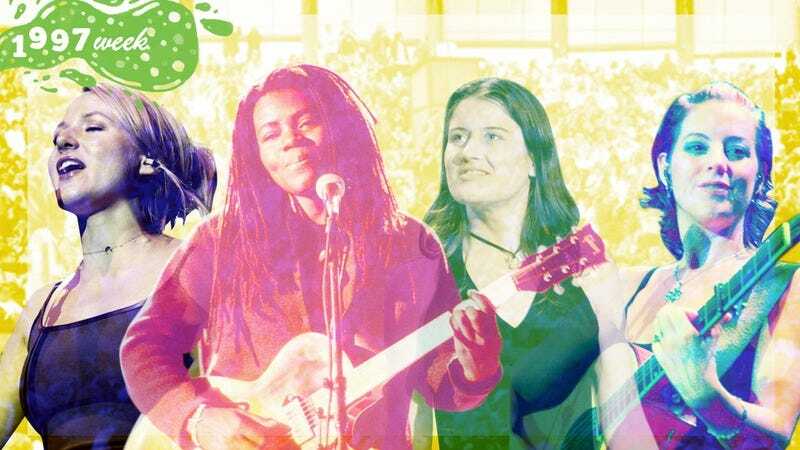 While putting a woman or women of color in charge would tilt Lilith Fair on its axis, another thing that’s changed in the 20 years since its founding is the number of female musicians who aren’t necessarily frontwomen. What to do with a band like Boris, for example, whose singer is male, but whose female guitarist, Wata, lives to make ears bleed? However the lines are drawn, mixed-gender bands in 2017 run the gamut from Screaming Females’ ripping post-punk to Chromatics’ blissful synth-pop, and while the term “girl band” is thankfully not thrown around as much anymore as it was in the ’90s, all-female bands are playing everything from club gigs, like surf-rockers L.A. Witch, to theaters, in the case of sister trio Haim. Festival organizers would have an embarrassment of riches in terms of solo acts: St. Vincent, Neko Case, and Angel Olsen are already headlining festivals, with Chelsea Wolfe, Zola Jesus, Courtney Barnett, Esperanza Spalding, Jamila Woods, Mitski, Beth Ditto, and Lizzo all on their way there. Including ANOHNI, the first transgender woman to be nominated for an Academy Award for Best Original Song, would be a must, as would Latina artists like Jessica Hernandez of Jessica Hernandez And The Deltas or Bomba Estereo’s Liliana Saumet, a group that was underrepresented at the original Lilith Fair. That’s not even getting into up-and-coming female rappers like Young M.A. and Noname. And this is just a surface skim of newer artists (how great would a headlining Le Tigre set be?) from one woman—a woman who’s admittedly not as hip as she used to be and knows next to nothing about electronic music—that is in no way intended to be comprehensive. But the fact is that, if there was an enormous diversity of “women in music” to choose from in 1997, there’s an even bigger and more exciting pool of artists to choose from now. And for all its lameness, Lilith Fair contributed to that movement. Only with an expansive musical viewpoint and a commitment to diverse representation could you reclaim the “Lilith Fair” moniker, lasering off the name’s gently bohemian, downright boring implications like a dolphin ankle tattoo. Hell, maybe even add a couple of folk-pop “girl singers” on there. Why not?